A majority of planners claim their meetings are greener today than they were two years ago, according to a recent M&C survey. 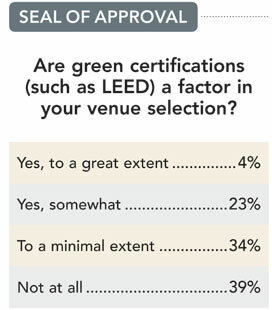 However, just 22 percent of the 146 respondents have a policy regarding green meetings. Costs are a consideration, with only 36 percent willing to pay more for eco-friendly practices. Half say they offer recycling on-site only if the meeting facility already provides that service. Interestingly, 17 percent of meeting professionals are unaware that convention facilities and hotels can be certified as environmentally responsible. 26% of planners always provide means for attendees to recycle paper, bottles and cans on-site. 27% print conference materials on recycled paper. Another 27 percent aren't sure if the paper is recycled, and 18 percent do not provide printed materials. 45% some-times donate leftover food to charity when possible; 8 percent always do so. 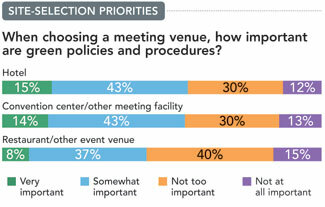 53% believe on-site conservation efforts are important to their meeting attendees. 83% are aware that facilities and hotels can be certified as environmentally responsible.